Badwater. 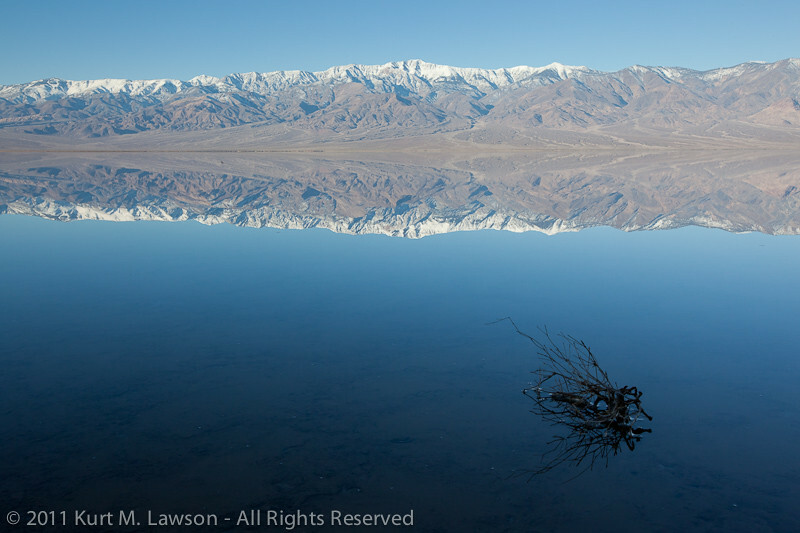 The name itself communicates the quality of any water found at this location in Death Valley National Park: bad. The water is incredibly salty. Too salty for any life to live. Perhaps this is the source of the name Death Valley. This place is the deepest spot in the dried up lake bed of ancient Lake Manly. 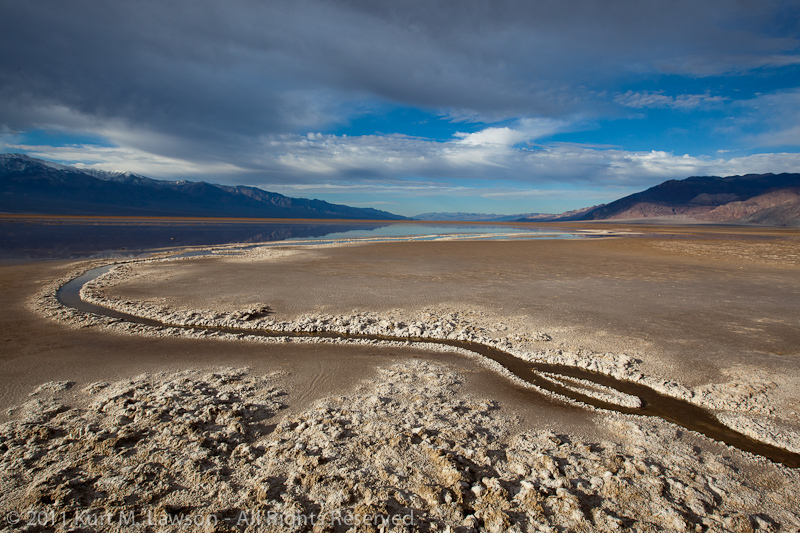 As the water dried up, the salts and minerals of that formerly massive lake gradually accumulated into the salty mess that is spread out throughout the playa for miles around Badwater. Badwater is also the lowest place in North America, lying 282 feet below sea level. I first visited Death Valley in 2008. I was really starting to break back into my photography after several years of neglect. A friend of mine invited me along on a photo trip and then it was love at first sight. Growing up in the flat lands of northeast Indiana, I had never seen such a harsh, desolate and beautiful landscape. It was really akin to going to another planet. In places there is no plant or animal life to be seen in any direction. The imagination can run wild. One of the photographers in the group had visited Death Valley in 2005 after the “100 year rains” that year. As you can see in this satellite imagery, a small fraction of Lake Manly reformed. The water was so deep that you could actually kayak across the valley becoming the first humans likely to have done this in the history of the Earth. After hearing the stories and seeing images of this flooded landscape, I made a resolution in my mind to revisit Death Valley often, and especially if the flood returned. Fast forward to December 2010. Southern California experienced a huge drenching rain storm that lasted several days and stretched way up the state. I anxiously looked at the spotty weather radar of Death Valley’s surrounding areas. The rain was very much like I remember in 2005 in southern California, so I was hoping that the valley would be experiencing a similar repeat. At the time, however, I was working like crazy, had family visiting from out of town and then was myself traveling out of town for the holidays. I was determined to go to Death Valley at the earliest possible moment. I flew back to California on January 6, and in the early hours of January 7 I was on the road. Driving into the park, from the south, I soon started seeing signs of water. 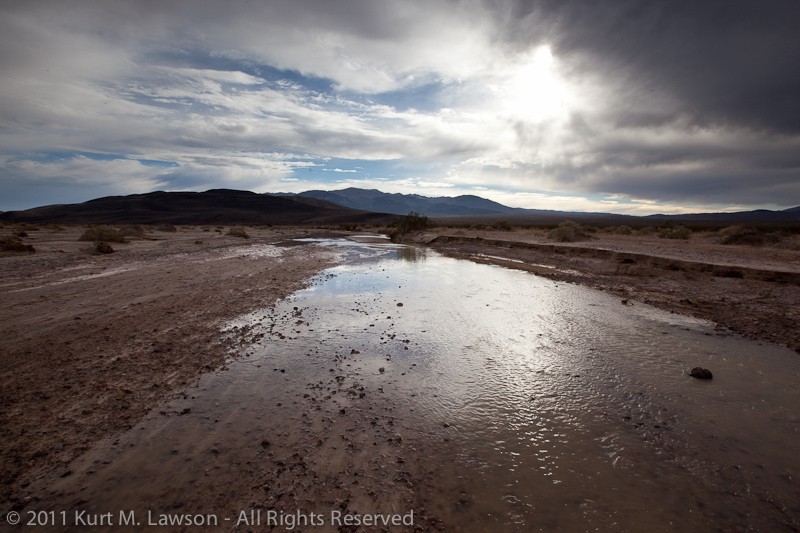 The Amargosa River was flowing. Continuing on, I found puddles along the road, and even this bizarre river lined with salt which wound off into the distance where I could make out several square miles of water ahead. Usually when I visit Death Valley, I will head out into the salty playa around Badwater and north of Furnace Creek in search of puddles of water for reflections. This was water unlike anything I’ve ever seen there. This was not quite 2005 levels, certainly, but the water stretched for miles. Near the actual Badwater turnout in the park, the water was a near perfect mirror. There was no wind at all. Amazed at what I saw, I made a plan for the following morning. I thought wrongly that if Badwater had that much water, perhaps the area where Salt Creek impacts the West Side Road would have far more extensive flooding than usual. Unfortunately, it did not. It was a nice and quiet sunrise, but I was not satisfied as most winter visits to Death Valley can yield similar images at this location. I headed back to Badwater and shoot the picture at the very top of this post. I then visited an area of the Mesquite Dunes that I have not previously visited, and then headed back to Badwater to wade once again out into the water. Having camera gear over a lake of salty water (much saltier than the Ocean) is a very precarious place to be. Salt water kills electronics and cameras and lenses. It’s highly corrosive, and thus lens changes out there are quite a challenge. Nevertheless I made a few lens changes out there and managed not to drop any gear into the water. For my second sunset at Badwater, I didn’t know what I was in for. The one the night before I thought was ok, but sometimes it’s just really hard to predict what the clouds are going to do. This was definitely one of those times. I was out early with the late afternoon light. The water again was like glass. No wind! Symmetrical compositions were everywhere. So, I waited. I practiced the art of standing perfectly still in the water so as to not cause ripples. If I moved my feet, ripples would emanate from my feet and it would take 5 minutes before they would clear to the point where they would not show up in a shot. To shoot sunset, I knew I would have to keep my feet planted and twist at the waist at most. I planted the tripod into the salty mud in a place that I could shoot panoramas. I waited. Finally the sun dipped below the Panamint Range, and still I had no idea about the visual treat that was about to unfold. And then finally, it happened. WOW! The sky exploded with color! A dark, symmetrical explosion of color that stretched 180 degrees burst into the sky. I frantically clicked away the shutter. I shot panorama after panorama as the light changed, carefully twisting my body only at the waist (as ripples would have ruined the reflection) and shooting in many cases blindly to the sides. I would pause ever few seconds and just stare wide-mouthed at the scene before me. It was the single most dramatic sunset I’ve ever experienced. Truly amazing. And, I feel as though I captured it. Click below to view the panorama on black (and there is a larger size than that on flickr as well). Instantly any thoughts of shooting more star trails anywhere else evaporated like a cup of water in a Death Valley July. I raced back to Badwater and plopped the camera back in a nearly identical spot, and this time aimed to include the North Star. For the second time in less than 12 hours, a flooded Badwater in Death Valley had utterly blown me away. Amazingly, both of these shots were taken with virtually no wind. In the second one, at the very end of the exposure there is some wind causing ripples which broaden the reflected star trail lines, but overall it’s a near perfect reflection. This is a side of Death Valley that I had never seen. I had never seen star trail pictures with perfect water reflections before. The second star trail image is my most viewed image on flickr. It has the highest “interestingness” rating there in my work as well, and was (along with the “WOW” panorama) in the “Explore” section for the days they were posted. After shooting the star trails, I should have stayed and shot sunrise there. I had other ideas though and headed for the dunes for my morning. While there were no reflections to be found amongst the piles of sand, there was one additional thing that I had never seen before here. There was frost in the sand. The frost added some interesting highlights to the sand in the morning light. After one final 3-mile hike into the center of the valley near Salt Creek, I headed back to home. I was nothing but smiles even through the hours that I was behind the wheel. Waking up at midnight did make for a seriously long day, but the rewards will last me a lifetime. My next post will detail my return trip just two weeks later, and then after that I have some exciting trips to Joshua Tree, and Channel Islands to share. Stay tuned.